It doesn’t matter if you live in Maryland, California, Northern Virginia, or Texas. Every homeowner wants the same thing: a beautiful house. And it all starts with curb appeal. The outside of your home is the first thing guests and passersby see. It is what they use to form their first impressions of your home. What does your curb appeal say? If you think your curb appeal is lacking, there is a cost-effective way to boost the aesthetics of your front yard: a Vinyl Fence. The right fence can really make your home stand out from the crowd, while also boosting your home’s value. First and foremost, vinyl fences can add Curb Appeal to any home. These fences come in numerous aesthetically pleasing styles. Vinyl fences are also Low Maintenance. 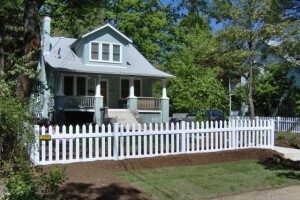 Unlike wood fences, these fences never need to be painted or stained. Did you also know that vinyl fences are incredibly Durable? They are built to last. In fact, vinyl fences are nearly five times stronger than wood. Best of all, vinyl fences are very Affordable. This is especially true when you consider how much you save in maintenance over your fence’s lifetime. If you have any questions about Vinyl Fences in Northern Virginia, please contact Hercules Fence of Manassas, Virginia today by calling (703)551-2609 or visiting our website. Also, check out Hercules Fence of Manassas on Facebook,Twitter, Google+ and YouTube! This entry was posted on Friday, November 22nd, 2013 at 2:34 pm. Both comments and pings are currently closed.